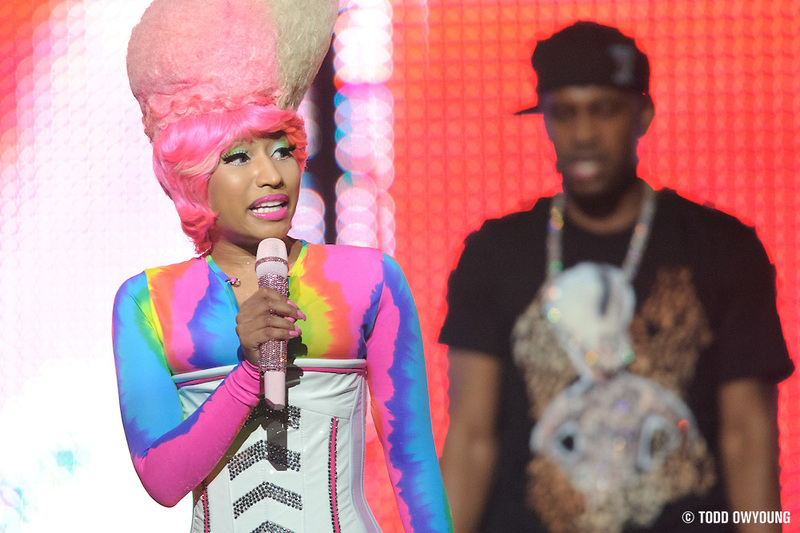 Nicki Minaj is arguably the most visually exciting act on Lil Wayne's I Am Still Music Tour. With an outrageous wig, a screaming constume, and fantastically bright lights, I have to say that it may be well worth photographing this show just for Minaj's stage antics. Which, I should say, are considerable. Just going to put it out there up front – Nicki Minaj is probably one of the better reasons to photograph the I Am Still Music Tour with Lil Wayne. 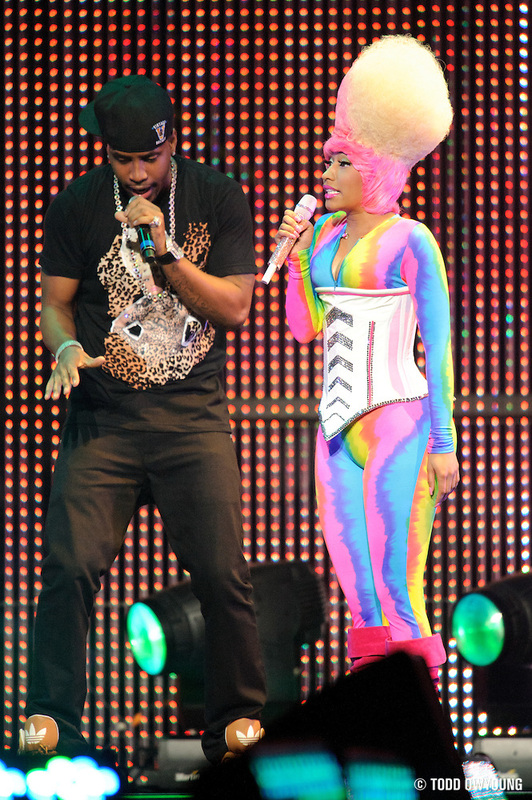 No disrespect to Weezy himself, but Nick Minaj has the better lights, moves and costume. In short, she's a great photography subject, even at 40 or 50-meters. Just as with all the performers on the I Am Still Music Tour, I photographed Nicki Minaj with the Nikon 400mm f/2.8 and NIkno TC-17E II 1.7x teleconverter that I rented from BorrowLenses.com. On the full-frame Nikon D3, this combo resulted in a 680mm effective focal range at a maximum aperture of f/4.8. 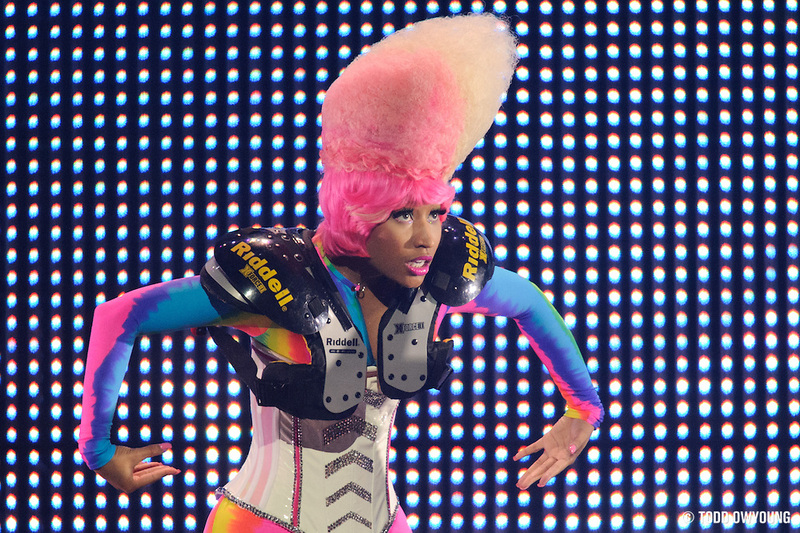 Overall, this setup performed very well for Minaj. While I wouldn't have minded more reach at times, what this lens and teleconverter provided was a great balance between getting me “ballpark” close and while still leaving room to crop to a desired frame. The one big challenge with a super telephoto is going too tight, which would have meant more trouble tracking and sacrificing wider frames that captured Nicki Minaj's great gestures. Hey Rachel, thanks for the kind words, I appreciate the comment. Wow! I have to agree these are the best images of the night. With the number of soundboard shoots increasing, are you considering picking up a 400mm for yourself? I’d have killed for one of these for the Cornell soundboard shoot last weekend (and an FYI in case you have that show coming up). Lighting is abysmal but the show is brilliant.